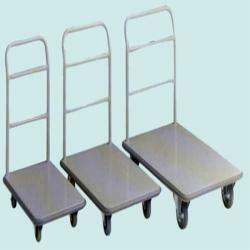 Our esteemed clients can avail from our organization an extensive array of Industrial Trolleys. We utilized supreme-grade stainless steel in order to manufacture the offered products as per the prevailing market demands. Owing to their high strength, offered products are widely used for heavy duty items. Moreover, to suit the varied demands of our clients, we are providing all these product in different dimensions and grades. With assistance of our highly skilled professionals, we have been able to provide an excellent array of Material Handling Trolleys to our clients. Offered products are manufactured by our professionals with superior-grade stainless steel incorporating latest technologies. Owing its high strength, reliability for a longer service life and excellent design, these trolleys are highly acclaimed by the clients. 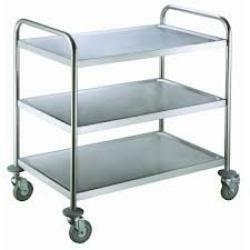 Looking for “Stainless Steel Trolleys”?